Search for the best flight prices from Manchester to Trapani. Compare prices, book today and save money with Manchester Airport. Trapani is steeped in history and as a result there are numerous sights to take in, including the church of Santa Maria di Gesu and Museo Nazionale Pepoli. With its pretty, historic centre and extensive beachfront, Trapani is a great place to relax, and the four-star Hotel Baia dei Mulini (7 Via Lungomare Dante Alighieri) epitomises this laid-back feel with its swimming pool and private beach area. Less expensive, and ideal for those who want to be close to the heart of things, the Porta delle Botteghelle (31 Via Serisso) offers comfortable accommodation in a 19th-century townhouse near the harbour. If you really want to relax in style, the historic Resort I Mulini (11 Via Lungomare Dante Alighieri) is set in verdant grounds featuring an old windmill. Via Torrearsa and Via Garibaldi are the streets to note down when planning a shopping trip in Trapani, as these are home to the majority of the city’s shops and boutiques. Stefania Mode (23/29 Via Torrearsa) is a good place to start, particularly if you’re in the market for Italian designer goods – the boutique stocks Prada, Dolce & Gabbana and Salvatore Ferragamo among others. For less exalted high-street names, try Corso Vittorio Emanuele and the area around Palazzo Senatorio. Outside of the city, the small town of Erice is worth a visit. Its famous frazzate carpets and various gifts, from antiques to homewares, can be picked up here at reasonable prices. 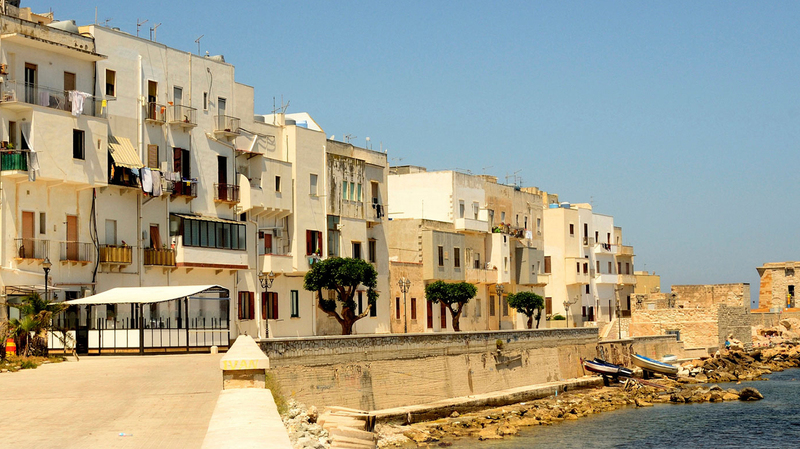 Trapani is famous for its food, thanks to its fabulous seafood, pasta and couscous dishes. Start your culinary tour at Cantina Siciliana (36 Via Giudecca), which makes its pasta on the premises and specialises in local dishes. Also worth a look is Taverna Paradiso (22 Via Lungomare Dante Alighieri), particularly if it’s fish you’re after – the restaurant is said to serve the best of the latest catch in Trapani. Away from the city, head to La Pentolaccia (17 Via Guarnotta) in Erice for superb fresh fish in a former monastery. The run-up to Easter Sunday includes a huge procession featuring the misteri (mysteries), a collection of 20 statues that represent different stages of the Passion. Trapani’s annual wind festival might celebrate sailing with a spectacular regatta, but 12 days of concerts, street parties and performances mean there’s also plenty for landlubbers to enjoy. A series of free opera and ballet concerts, this festival takes place at the stunning Villa Margherita on the outskirts of the city, and stages a mixture of established singers and new talent, including a competition for aspiring singers. Erice harks back to its 15th-century past with this unique series of concerts celebrating the best music Italy’s Renaissance masters could muster. Perfect for a relaxed day out, the event attracts cheerful crowds and provides a friendly atmosphere. This annual dedication to the Virgin Mary includes a procession by candlelight accompanied by a marching band winding through the streets of Trapani. Bonfires, colourful fireworks and feasts round off proceedings.